Wisconsin Oven Corporation shipped an electrically heated enhanced duty batch oven with powered load car to a heavy equipment manufacturer. The batch oven will be used for pre-heating and tempering a variety of steel components. When designing an oven for a heavy load weight such as this project, the airflow arrangement and heating input are key factors in achieving the desired heat up rates. Wisconsin Oven Corporation shipped an electrically heated enhanced duty batch oven with powered load car to a heavy equipment manufacturer. The batch oven will be used for pre-heating and tempering a variety of steel components. It is designed with the capability to heat 15,000 pounds of steel at a time per the customer’s requirements. This tempering oven has a maximum temperature rating of 500° F and work chamber dimensions of 8’0” W x 8’6” L x 5’0” H. The customer required guaranteed temperature uniformity of ±10°F at set points of 300° F and 500° F. A fourteen (14) point profile test conducted in an empty oven chamber under static operating conditions was performed to confirm the uniformity. The tempering oven is constructed with tongue and groove panel assemblies that feature Wisconsin Oven’s patented high efficiency panel seems and provide 25% better insulating efficiency. The recirculation system utilizes combination airflow to maximize heating rates and temperature uniformity of the product. A powered load car rated at 15,000 pounds utilizes a variable frequency AC drive with electronic torque limiting to move the load in and out of the oven. “When designing an oven for a heavy load weight such as this project, the airflow arrangement and heating input are key factors in achieving the desired heat up rates,” Jeff Judd, Sales Engineer. 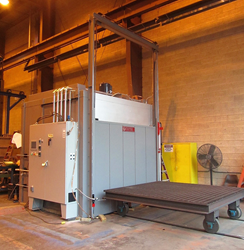 This tempering oven was fully factory tested and adjusted prior to shipment from our facility. All safety interlocks are checked for proper operation and the equipment is operated at the normal and maximum operating temperatures. An extensive quality assurance check list was completed to ensure the equipment met all Wisconsin Oven quality standards. This equipment is backed by Wisconsin Oven’s Exclusive and Unprecedented 3-Year WOW™ warranty (parts only).